provide branding and marketing expertise and strategy, design and production of print, web, and audio-visual marketing materials, and procurement of media placements for advertising materials (radio, TV, web, and/or print ads) for University Relations. 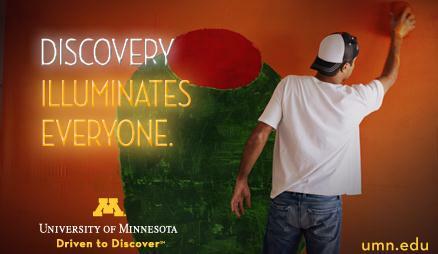 Survey research from across the state indicates the marketing efforts in support of the Driven to Discover brand are having a significant impact. Positive public perceptions about the University have shifted upwards and the public is understanding and valuing the University as a leading research institution. See pp. 24, 31 of the May 10, 2012 report of the Board of Regents Finance & Operations Committee. Yet the facts do not support the decision to continue to pour millions of dollars into advertising. The campaign has not produced support at the state legislature. State appropriations have declined from $651 million in fiscal year 2010 to $623 million in fiscal year 2011 to $572 million in fiscal year 2012. See p. 14 of the 2012 U of M annual financial report. What about the effect of advertising on donors? The administration told the Regents: "When the campaign was not in the market in 2009, perception of the University and awareness of its impact declined." See p. 31 of the May 10, 2012 report. But gifts and pledges from donors were greater in 2009 than in 2010, 2011 or 2012. See the historical overview at p. 4 (right hand column) of the 2012 Report on Giving. The state of the economy is a significant factor in determining the level of giving in any given year. So are the decisions of very wealthy families to leave a legacy and the decisions of corporate donors to support a program. Such sophisticated donors do not base their decisions on television commercials. Their decisions are the result of personal contacts over the years--as the then president of the U of M Foundation acknowledged in 2011. See section 2 of University Inc. Part II. Yet it appears that a survey showing an "upward shift in public perception" trumps reality and the historical record. So the administration continues to enrich an advertising agency at the expense of educating our children. 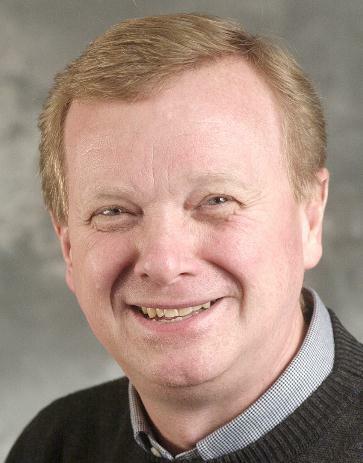 Rep. Gene Pelowski, chair of the House higher education committee, announced this week the budget information he wants from the University of Minnesota and Minnesota State Colleges and Universities systems. In a news release, Pelowski, DFL-Winona, said that he has "set a schedule for extensive hearings on how the Great Recession has impacted higher education in Minnesota." "Budget information from 2006-2012 in order to get a full picture of the impact of historic cuts, historic tuition increases, and historic student debt over that time frame. The request lists 11 categories broken down into over 25 specific topics the committee would like to hear more about." Student to faculty ratios and funding by number of students. "In particular, these questions will be examined across each campus and system to gauge how students may have been impacted differently based on their specific college and even their specific major." "A breakdown of all administrative positions and their costs at the campus and system levels from 2006-2012, as well as any bonuses paid out to those positions. In addition, he will be looking to see what the MnSCU administrative size is in 2013 compared to the size of the three separate systems that existed prior to merging into the MnSCU system." The U goes first -- starting its presentation Jan. 28. MnSCU's next. All this is in addition to a report requested by Senate leaders that examines the U's administrative costs. More about that here. 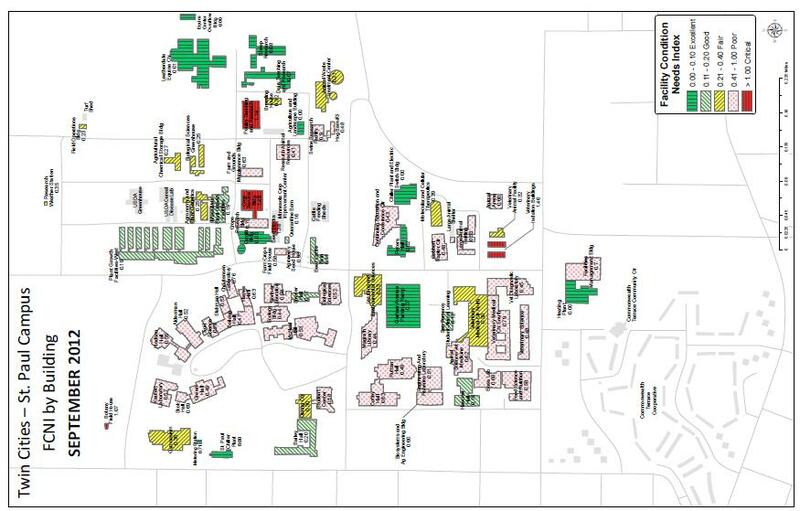 This map depicts facility condition geographically, allowing decision makers to quickly and easily review overall campus condition. The map is updated annually in September ahead of the FCA Update to the Board of Regents. Provide order of magnitude scope and budget for capital improvement projects. These are not intended to be detailed costing for project estimating. This index provides an indicator of relative condition for a building, group of buildings, or an entire campus. The FCNI is typically used for benchmarking. FCNI is calculated as Total Projects/Facility Replacement Cost. Projects include capital renewal, deferred maintenance and plant adaption. The U of M reports FCNI (over another common industry metric, FCI) since it shows the comprehensive condition of the facility, taking all needs into account, not just deferred renewal. The categories listed in the map are quite broad and the definitions are meant to put the needs into categories. The needs represent building system needs and do not necessarily reflect the functional nature of the buildings or their ability to provide usable space for programs. 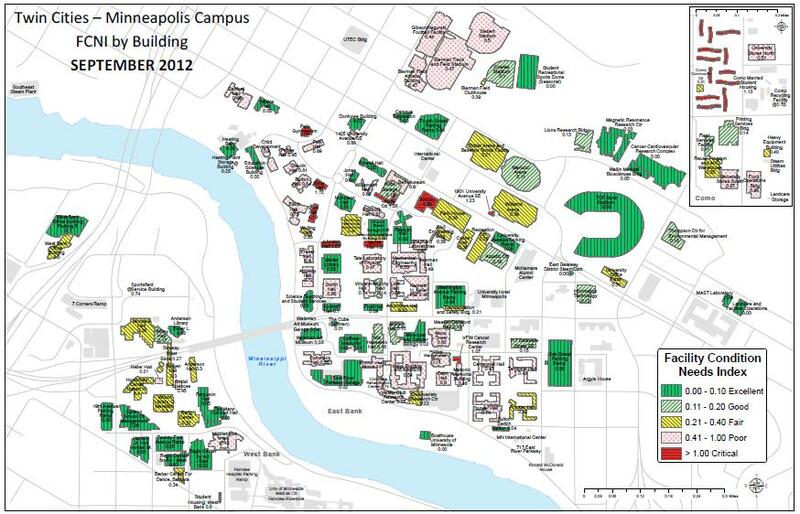 Facility Condition Assessments were first conducted on the Twin Cities Campus in 2002. Subsequently, a large portion of the buildings were re-assessed from 2005 to 2007. Six years, on average, have elapsed since the U of M has completed a comprehensive FCA so the quality of the information is not as accurate today. An RFP was issued in November 2012 for updated assessments and software to include all campuses and the Research and Outreach Centers. Words on paper cannot adequately convey the sense of honor and gratitude with which I joined your ranks this week. I accepted Purdue's presidency last June with a sense of profound respect for all that this historic institution represents, but the intervening half year has only served to deepen that conviction. I have tried to use the time afforded by the first-semester interim to learn all I could from and about you. I have made spare-time and weekend "field trips" to the campus, totaling some seventeen days. These trips have featured briefings on all the major functions of the school and tours of many major facilities. I have spoken to a host of experts across the spectrum of higher education, including more than a dozen current and past university presidents. I have visited campuses including Harvard, Yale, and Chicago, and attended seminars on topics such as the impact of technology and the restructuring of student assistance. And I have read as much as I could manage of the gusher of books, articles, and interviews which are everywhere these days, predicting major change or even upheaval in American higher education. Most useful of all, I have been given the opportunity to meet hundreds of the faculty and students who are Purdue. In college-by-college leadership meetings and open forum sessions, and a series of informal lunches, dinners, and evenings in faculty homes, I have commenced what I hope will become years of cordial and mutually rewarding relationships. To all those who attended or arranged these opportunities, heartfelt thanks. Two themes ran steadily through these conversations. First, that Purdue is an extraordinary place, making life-changing differences in the lives of its students and often the lives of people around the world. Second, that the higher ed world we have known is likely headed for big change, although I heard a full range of opinions about its nature, extent, and what if anything Purdue should do to react to it. I doubt that even the most focused and specialized of Purdue researchers has failed to notice the criticisms and the sometimes apocalyptic predictions swirling around higher education these days. They come from outside observers and lifelong academics and from all points of the philosophical compass. College costs too much and delivers too little. Students are leaving, when they graduate at all, with loads of debt but without evidence that they grew much in either knowledge or critical thinking. Administrative costs, splurging on "resort" amenities, and an obsession with expensive capital projects have run up the cost to students without enhancing the value of the education they receive. Rigor has weakened. Grade inflation has drained the meaning from grade point averages and left the diploma in many cases as merely a surrogate marker for the intelligence required to gain admission in the first place. The system lacks accountability for results. No one can tell if one school is performing any better than another. The mission of undergraduate instruction is increasingly subordinated to research and to work with graduate students. Too many professors are spending too much time "writing papers for each other," researching abstruse topics of no real utility and no real incremental contribution to human knowledge or understanding. Diversity is prized except in the most important realm of all, diversity of thought. The academies that, through the unique system of tenure, once enshrined freedom of opinion and inquiry now frequently are home to the narrowest sort of closed-mindedness and the worst repression of dissident ideas. Athletics, particularly in NCAA Division I, is out of control both financially and as a priority of university attention. 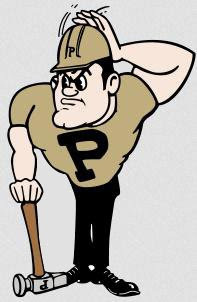 However fair or unfair these critiques, and whatever their applicability to our university, a growing literature suggests that the operating model employed by Purdue and most American universities is antiquated and soon to be displaced. In the space of a few weeks last fall, a Time cover story called for "Reinventing College," a Newsweek cover asked "Is College a Lousy Investment?" and a USA Today page one feature declared "College May Never Be the Same." Other voices, many from inside the academy, had even more striking assessments. And, most succinctly and perhaps most credibly, from Stanford's esteemed President John Hennessy: "There's a tsunami coming." Well, with full respect for President Hennessy, he wouldn't be the first seismologist to issue a warning about an earthquake that never happened. Still, it seems prudent to ask, given a risk of such an event, how a coastal community should respond. There are three possible categories: 1) "It's a false alarm. Forget about it." 2) "There may be a tsunami, but don't worry, it's not coming here." 3) "Get busy, just in case." I've been party to the over-reading of trends and the overreactions it can cause; these mistakes have taught me never to be dismissive of criticism or warnings, but also to move cautiously in response. And it's become my firm conviction these last few months that, whatever the validity of the statements above, Purdue has a chance to set itself apart as a counterexample to much of the criticism lodged against higher ed in general. Presented with such a possibility, we have a duty to seize it. We would fail our duty of stewardship either to ignore the danger signs all around us, or to indulge in denial and the hubris that says that we are somehow uniquely superb and immune. Excellence – Now and then the most obvious truth bears restatement. One such truth is that Purdue is not its buildings, or even its wonderful past and traditions. Purdue at any point in time is its faculty, its students, and the magic that happens when they are brought together effectively. What the legendary President Robert Hutchins said of the University of Chicago a century ago is true of Purdue now: "This would be a great university if it met in a tent." Gathering and husbanding resources for investment in best-in-class faculty, and actions that maximize faculty interaction with students, most particularly including undergraduates, must be top priorities, on all our campuses, this year and every year. Our preeminence in research must not merely be maintained, but strengthened. Excellence in the new era will likely have to be based on something more than reputation. Performance, especially in the intellectual growth of students, will have to be measured, quantified, and documented. Why should our university, already strong in the few indirect measurements that exist, not be a leader in taking accountability for the excellence to which it lays claim? Affordability – There is no denying and no defending it: College costs have exploded in America, especially in the last decade or so. Student debt has soared past a trillion dollars, amounting to far more than total credit card debt. Every university community should embrace the shared responsibility to reexamine current practices and expenditures with a determination to keep its tuition and fees within the reach of every qualified student. We should all remind ourselves every day that the dollars we are privileged to spend come, for the most part, from either a family or a taxpayer. We measure many activities by FTEs, full-time equivalents; we should likewise see every $10,000 we spend as an "STE," a student tuition equivalent. Any unnecessary expenditure of that amount could instead have enabled a student to attend Purdue for a full year. Shared governance – I subscribe entirely to the concept that major decisions about the university and its future should be made under conditions of maximum practical inclusiveness and consultation. The faculty must have the strongest single voice in these deliberations, but students and staff should also be heard whenever their interests are implicated. I will work hard to see that all viewpoints are fairly heard and considered on big calls, including the prioritization of university budgetary investments, and endeavor to avoid surprises even on minor matters to the extent possible. Shared governance implies shared accountability. It is neither equitable or workable to demand shared governing power but declare that cost control or substandard performance in any part of Purdue is someone else's problem. We cannot improve low on-time completion rates and maximize student success if no one is willing to modify his schedule, workload, or method of teaching. Participation in governance also requires the willingness to make choices. "More for everyone" or "Everyone gets the same" are stances of default, inconsistent with the obligations of leadership. Engagement – A hallmark of our land-grant mission is the duty to extend our boundaries beyond the campus, to the borders of our state and sometimes beyond. Where once we exported primarily progress in agricultural science, today the opportunity and therefore the duty is much wider. An area of much recent success, but requiring continued emphasis and development, lies in the more rapid and continuous transfer of Purdue technology into the marketplace. We must produce and recruit scholars imbued with a passion to see their genius converted swiftly into goods and services that improve human life, scholars who say as one of Purdue's most renowned faculty leaders said to me, "It's not an innovation until it's useful to someone." There is no greater societal contribution we could make to a nation struggling to maintain economic opportunity and upward mobility, and there is no more tangible way to demonstrate to our fellow citizens the high return their investments of tax dollars in us can bring. The definition of our targets for engagement does warrant ongoing reflection. As I moved from college to college in my visits to Purdue, the zeal for "global" activities was everywhere, but often unfocused and of widely varying clarity of purpose. A question another great university I visited is asking itself right now may be useful for us as well: "Are we a global university, or an American university with a global perspective?" I have no firm view on this issue other than that any activities beyond our home state's borders should be carefully chosen, meaningful in impact, and designed for excellence in execution. Open inquiry – A university violates its special mission if it fails to protect free and open debate. It is the wellspring of advancing knowledge and the rationale for academic freedom. No one can expect his views to be free from vigorous challenge, but all must feel completely safe in speaking out. One can hope for a climate of courtesy and civility, and "speech" that attempts to silence or intimidate others must be confronted strongly, but the ensuring of free expression is paramount. This is, if anything, even more important when the point of the expression is to criticize decisions of the university administration itself. Common purpose – A priceless asset of any great university is the independence of its faculty and the frequent individual breakthroughs, in both teaching and research, that it produces. Again and again, as I have moved through the colleges and gatherings of faculty, I heard the phrase "independent contractors" used to describe the working relationship between the school and its professors. Similarly, I was struck forcefully by the separation among our eleven colleges. A newcomer quickly notices that we are less a "university" than a federation. Obviously, specialization and intellectual autonomy enable the excellence we seek. But, for instance, the widespread duplication of identical functions can work against the common goal we must have of affordability and liberating resources for new investments in faculty and facilities. As so often in life, the phrase "Fine, up to a point" applies. I hope to find, and perhaps here and there to foster, a somewhat stronger sense of common purpose as we work through the decisions presented to us by a changed environment. Without knowing what they will be or when we will make them, many choices will necessitate a communitarian outlook that consciously places the interests of the overall university first. These are but a few preliminary thoughts, each of them stimulated and informed by the interactions of the last six months. As I often said during the Q&A forums of last fall, I reserve the right to be instructed otherwise, and to reverse field when shown I should. But I do urge that we engage on these issues, as many of us as are willing, because the seismologists could well be right this time. Maybe the oldest quip (certainly the tiredest) in the higher ed lexicon is "the fights are so fierce because the stakes are so low." It's a great line, and undoubtedly rang true when coined. But the stakes aren't low anymore. We may well need to fight less fiercely and rally together somewhat more often. My fundamental observation and greatest source of excitement about the chance to enlist with you is that Purdue, already a leader, has a chance to separate further from the pack. In a market now demanding value for the education dollar, we plainly offer it. While others offer curriculum of weak rigor and dubious relevance, we are a proud outlier. As I said to my fellow freshmen at Boiler Gold Rush, "You have chosen a tough school. Congratulations!" And in a world dependent for growth on the rate and quality of technological innovation, Purdue, given the high quality of its discovery and research talent, has a chance to dazzle and deliver. From times of stress and difficulty, in any category of endeavor, strong and farsighted enterprises emerge stronger than before. If there is in fact to be a shakeout in higher education, let's resolve ourselves that Purdue will not merely survive but thrive, and find itself much higher than today, in the first rank of the world's great centers of learning. Among the many traditions I admire about our university is its preference not to recognize the arrival of a new president with any kind of ceremony. That suits me fine; if an investiture event had been the custom, I'd have tried to beg out of it. To me, one can best honor a position like this one by simply showing up and going to work. Thank you for letting me do that, and for the marvelously warm welcome you have shown an eager newcomer. For our first century as a nation, U.S. presidents did not travel to Congress and deliver State of the Union orations, they simply wrote them and sent them up to be read at Congress' convenience. I liked that tradition, too, and thought it better to imitate it here, rather than to create the extra work and possibly the disruption of a staged speech. The spoken part can come next, in what I hope will be countless conversations and consultations about the questions and suggestions presented in this letter. By now it should be apparent that I take up these duties with no agenda other than to strengthen further this magnificent institution, and to help it excel and prosper in whatever new environment it is forced to operate. In a recent biography of Dwight Eisenhower, a Columbia history professor of that time is quoted as saying of Ike's tenure as Columbia's president, "He didn't mess things up. That's what one hopes for in a President." Maybe, as in a physician, that's the first thing one hopes for. But somehow I imagine that most of you join me in much higher expectations and larger dreams. Those who do share those higher aspirations know that we can achieve them only by combining, in thought, talent, word and deed, in the common purpose of preserving what is best today and creating what is better still tomorrow in the Purdue that can be. State legislators have demanded an accounting of the administrative costs at the University. President Kaler has announced that an outside consulting firm will be hired to prepare an analysis. Fees of consulting firms are one of the costs of administration. In fiscal year 2012 the administration paid an astounding $34,815,696 for administrative consulting and professional services. See p. 17 at line 17(d) of the Report on Cost Definition & Benchmarking. Now the administration will pay a consulting firm to tell us, in part, whether it pays too much to consultants. Whether a consulting firm outside the University will produce an independent analysis remains to be seen. In October 2010 the administration retained a firm to prepare an economic impact study (to calculate the contribution of the University to the economy of the state). Before the study was conducted the U of M vice president for research declared: "We will structure the research to provide information that will serve to support government relations, advancement, and development." See p. 2 (final paragraph) of the Overview of Economic Impact Study (emphasis added). So the administration received the analysis it ordered. In other words, universities are complex, decentralized institutions. They waste a lot of money on redundant administrative activities and could probably save money in the long run if they made big changes to their structures. Kiley, Where Universities Can Be Cut (emphasis added). See also the November 2012 Bloomberg news report on Bureaucrats Paid $250,000 Feed Outcry Over College Costs at and The Cost of "Top Talent." At research universities--both public and private--efficiency has been considered an afterthought . . . . Before the [financial] crisis there was little incentive for institutions to work to lower the cost of producing a graduate. U.S. News & World Report does not give points [in its rankings] for producing a degree at low cost. In fact, the methodology actually weighs higher expenditures per student as a positive. Kiley, (referring to the remarks of Ronald Ehrenberg, director of the Cornell University Higher Education Research Institute)(emphasis added). Here at the U of M there was public outrage in early 2012 when the news broke that President Bruininks handed out millions of dollars in "transitional" compensation and golden parachutes to departing senior administrators. The response of the administration included the release of the October 2012 Report on Cost Definition. President Kaler declares that the amount spent on "administrative oversight" is limited to 11% ($208,545,279) of the total compensation paid to all University employees ($1.9 billion). See p. 17 at line 13 (f), (g) and (h) of the Report. But "administrative oversight" is only part of the total cost of administration disclosed in the Report. See On The Cost of Administration Part III. See section 1 of The Rest of the Story (emphasis added). Part of the administrative problem at the University of Minnesota has been poorly analyzed and off-mission grasps at cash. . . . The sacrifice of an essential research and teaching site at Rosemount for gravel mining was cited in recent Wall Street Journal and Star Tribune articles. [President] Kaler could bring an end to these disastrous forays by publicly recognizing that not even the university can turn gravel into gold nor transform exurban development into a model of sustainability. The academic home of Norman Borlaug should recognize that its value is in research and education to improve food supply, energy, the environment and health, and that attempting to trade away any of these missions for short-term cash will diminish the university. See The MoreU Park Fiasco (emphasis added). See also section 3 of The Rest of the Story. The voices of such well-qualified professors are seldom heard by those in authority. The Regents are part-time volunteers. They rely on the senior administrators to sift through the enormous volumes of information about the University, so they see only the information selected by the administrators. See section 2 of Going To Market Part II. Nor do the Regents have much time to listen to other members of the University community with different perspectives. The Regents develop a bond with the senior administrators with whom they spend most of their time and thus have a tendency to dismiss other viewpoints. State legislators have even less opportunity to learn about the operations of the University from the people in the trenches--professors, staff, and students. The legislature needs a qualified person who can devote full-time attention to the University in order to provide reports on its operations to the higher education committees. This legislative liaison should have the responsibility to review the information produced by senior administrators, to collect additional information through his or her own independent research, and to meet with all groups at the University so that perspectives of other well-informed and thoughtful members of the University community are presented to the legislature. The University of Minnesota will hire an outside consultant to review its administrative structure and costs, President Eric Kaler announced Friday, Jan. 11. The decision comes two days after Kaler received a letter from two DFL legislators calling for a report on operational spending. The letter, from Senate Majority Leader Tom Bakk and Terri Bonoff, the chair of the higher education finance committee, was inspired by a recent Wall Street Journal article on growing overhead at the U that rekindled long-standing questions on the issue. In a press briefing outlining the university’s priorities for this legislative session, Kaler said bringing in an outside consultant to do the review will give it “external validation.” He said he is not sure yet if the report’s cost will meet the threshold that will require bidding out the job. At the briefing, Kaler pushed back against the national coverage, saying a look at growing payroll costs must more fully account for spiking enrollment and research grants. The university’s $1.1 billion biennial budget request includes a commitment to trim administrative spending by 5 percent over two years, and Kaler has already made some cuts. The U also promises to freeze resident undergraduate tuition if the state chips in an extra $32.6 million over two years. In their letter to Kaler, Bakk and Bonoff asked for an interim report by March, followed by a more in-depth report later. “Having this interim report will provide us with a strong tool as we formulate and hope to pass our 2013 budget,” they wrote.